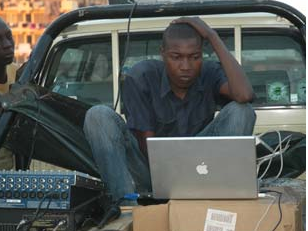 Fred Orek, a cameraman and assistant editor with the Kenyan video collective Slum-TV, works on a shoot in October 2007. Share Digg del.icio.us Reddit Newsvine Kenya’s Indy Media By Michelle Chen While news reports across the world have displayed images of chaos shaking Kenya, an alternative media system driven by ordinary Kenyans is emerging in the East African country to help raise the voices of the seldom heard. The violent aftermath of President Mwai Kibaki’s disputed election in December has detonated Kenya’s festering ethnic, land and power struggles, leaving hundreds dead and displacing hundreds of thousands. But it has also energized the country’s independent media-makers, many of whom see their work as key to overcoming the crisis. Fusing mass communication with political organizing, the Kenya Independent Media Center (IMC) has aired local activists’ perspectives on the violence and its root causes. Through its growing network of independent reporters, IMC Kenya aims to generate “information for action,” according to co-founder John Bwakali. Some youth are amplifying their voices through a video collective called Slum-TV, led by Kenya-based media activists. By documenting everyday struggles in Mathare—a densely populated slum in the capital Nairobi—the project enables young people to produce homegrown media and, through local public screenings, fosters community dialogue. Following the outbreak of the post-election violence, Slum-TV has focused on current recovery efforts that bring together activists from different ethnic groups. Slum-TV co-founder Sam Hopkins noted the contrast with corporate media’s coverage of “tribal” violence. “The idea behind focusing on characters who have crossed the ethnic divide is really just to provide another version of what’s happening, to counteract the mainstream international media,” he says. As an ear to the ground in their communities, grassroots media activists have sometimes been ahead of the news. Though still in its infancy, grassroots reporting is gaining traction in Kenya. Since 2007, the Web-based Voices of Africa project, an initiative of the Africa Interactive Media Foundation, has delivered field reporting from mobile-phone-based correspondents in Kenya. Its coverage features video commentary from everyday people on politics, underlying social problems and concerns about the ongoing mediation talks. Although Kenya’s independent media-makers generally do not face outright authoritarian restraints, more insidious barriers can impinge on their work. IMC Kenya reporter Oscar Odhiambo recently fled Kenya temporarily for Tanzania, in part, he says, because he felt that as an independent journalist, he risked being targeted by violent factions for speaking out. Meanwhile, he says, Kenya’s establishment press has failed to hold powerful officials and business elites accountable because it is hampered by corporate control. “The media as an institution must be set free,” he says, “so that we as independent journalists can also use that freedom to express an autonomous view of what we believe is true.” Yet one of the most immediate challenges facing independent media activists is simply logistics. Reflecting the global “digital divide” between North and South, Kenya’s online infrastructure is threadbare. Internet users make up less than 10 percent of Kenya’s population, according to international estimates; both media producers and consumers typically lack consistent access. In response, media-makers are repurposing old-school technologies to reach new audiences. While IMC Kenya runs a website, co-founder Bwakali acknowledged that its digital material is out of reach for most Kenyans. The key is to capitalize on “good old traditional distribution networks,” he says—cassette tapes and compact discs, distributed hand to hand. The group also plans to work with mini-bus operators to air IMC recordings on their daily routes. For Slum-TV, just the shared experience of a public audience has deep social resonance. “To see the reaction of a crowd when we have a screening is really incredible,” says Hopkins. In Mathare, where hundreds of thousands struggle with poverty and political disenfranchisement, “the potential to affect people’s aspirations is huge.” Meanwhile, among the small community of wired Kenyans, blogs channel information, outrage and hope. In January, the blog Kenyan Pundit ran a self-penned “obituary” by writer Simiyu Barasa. “I know not my tribe,” he wrote. “I have only known myself as Kenyan, and others as fellow Kenyans. In these times, belonging or not belonging [to a tribe] means not being dead or being seriously dead. What chances does a person like me have?” While fostering political discussion, Kenya’s blogosphere has also taken a proactive role in coping with the crisis.